Let’s take a look at this Associated Press piece that is being prominently featured at the Fox News website. The headline writers certainly tried to make it appealing to those who are opposed to another Clinton presidency: Clinton opened State Department office to dozens of corporate donors, Dem fundraisers. 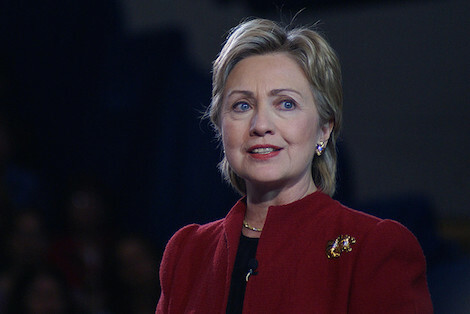 The woman who would become a 2016 presidential candidate met or spoke by phone with nearly 100 corporate executives and long-time Clinton political and charity donors during her four years at the State Department between 2009 and 2013, records show. Those formally scheduled meetings involved heads of companies and organizations that pursued business or private interests with the Obama administration, including with the State Department while Clinton was in charge. The AP found no evidence of legal or ethical conflicts in Clinton’s meetings in its examination of 1,294 pages from the calendars. Her sit-downs with business leaders were not unique among recent secretaries of state, who sometimes summoned corporate executives to aid in international affairs, documents show. Based on the fact that the AP found nothing unusual or unique about her meetings and that they aren’t even willing to allege any ethical conflict, let alone any legal issues, there appears to be no reason to read the rest of this article at all. But the difference with Clinton’s meetings was that she was a 2008 presidential contender who was widely expected to run again in 2016. Her availability to luminaries from politics, business and charity shows the extent to which her office became a sounding board for their interests. And her ties with so many familiar faces from those intersecting worlds were complicated by their lucrative financial largess and political support over the years — even during her State Department tenure — to her campaigns, her husband’s and to her family’s foundation. Are there any ethical issues or not? You just said that there is “no evidence” of ethical issues. None. Can I be a nudge here and simply ask that these reporters say what the mean and mean what they say? You think that a cabinet member who has political ambitions should be held to a higher and different standard from one who does not. So, for example, Colin Powell or Condoleezza Rice can meet with the CEO of Pepsi Co. without it meriting a snarling headline but Hillary Clinton cannot. But, if that’s the argument you want to make then you have uncovered an ethical conflict. Why not have the courage of your convictions and say so? Or, maybe, you want to carve an even more exclusive exception to your normal standards and argue that what really distinguishes Hillary Clinton from other cabinet members and former secretaries of State is that her husband is a former president who runs a big foundation. In this case, you’re creating a standard that only applies, and really only could apply, to Hillary Clinton. Even if she does something that doesn’t meet the ordinary criteria for creating an ethical conflict, she can still be hammered for doing something wrong because of unique circumstances that only pertain to her. Meanwhile, Mike Huckabee became a spokesman for a “Diabetes Solution Kit” that “the American Diabetes Association and the Canadian Diabetes Association caution consumers against” using. He also used his mailing list to promote cancer cures based on biblical passages. And let’s not forget that Donald Trump created a fake university that was such a scam that he was sued by New York Attorney General Eric Schneiderman. These are some pretty low-level examples of simple hucksterism, almost too mundane to compare to the cross-pollinating between the Clintons’ political ambitions and their operation of the Global Initiative. To see something similarly complex and ambiguous enough to bear a resemblance to the latter, you probably need to look into Jeb Bush’s long history with the charter school and school standards and testing movements. To be clear, just because one candidate is nakedly promoting fraud doesn’t mean that the press should avoid looking at another candidate’s complex financial connections. But it’s basically a smear to publish a piece like this one from the Associated Press, especially when you are unwilling to spell out your double standard and really justify the rationale behind it. And the headline writers take advantage, too, to get the clicks they’re after. This story says that Hillary Clinton did nothing unusual, illegal, or even unethical, but that’s not the impression the story and the headline leaves, is it? Haven’t we seen enough of this kind of media treatment of the Clintons over the years?